The January 2015 technical preview has a more natural interface, a cool digital assistant and lots of potential. The second preview release of Windows 10 begins to flesh out Microsoft's vision of an operating system that bridges the gap between traditional PCs and touch-based tablets -- something it failed at dismally in Windows 8. More than that, the new release reveals a single operating system that shape-shifts according to the device it's running on, be that a PC, a tablet or a phone. Several new features and design elements refine Windows' overall look and feel; they also show off a significant addition, the Siri-like digital assistant Cortana. All in all, this version of Windows 10 is still not a finished operating system, but it's shaping up to be a winner. The return of the Start menu, first seen in the previous Windows 10 build, is at the core of Microsoft's commitment to providing an operating system that works as easily on a traditional PC as on a laptop. Microsoft made several changes in this new release that moves it even further towards that goal. When I first installed this revision of Windows 10, I thought that perhaps I had done something wrong -- maybe even grabbed the wrong ISO file for installation. Where was the dreaded touch-oriented Start screen? All I saw was a desktop. Clicking the Start button or pressing the Windows button on the keyboard brought up the new Start menu, but not the touch-oriented Start screen. I nosed around various Windows settings to see if I could get the Start screen back. But no setting could be found. And that's because the Start screen has been relegated to the dustbin -- except for devices with screens smaller than eight inches. In its place are just the desktop and the Start menu. And that's a very good thing. 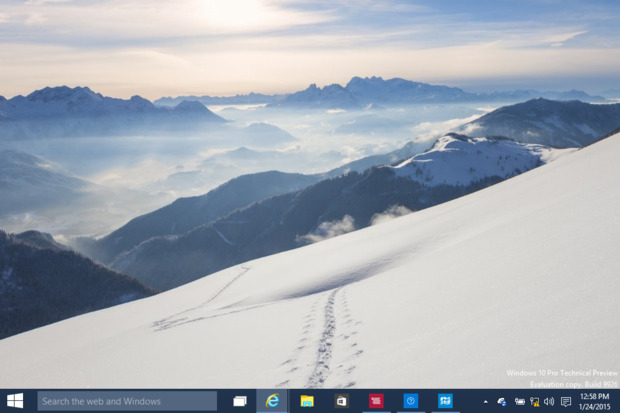 The Windows 10 Start menu as you would use it on a desktop or laptop. 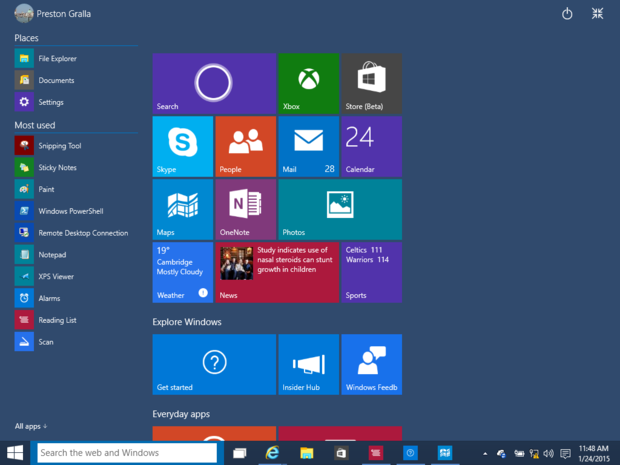 The Start menu in this version of Windows 10 is much like the one seen in the last technical preview. On the left-hand side of the menu is a list of apps, while on the right-hand side are live tiles of Modern apps (previously called Metro apps) that can display changing information, such as weather and news. However, there have been some changes. The left-hand side is now organized into two groups. At the top are "Places," including File Explorer, Documents and Settings. Below it are "Most Used" apps, which you would expect to list the apps you use most frequently. In practice, though, I found that not to be the case. After several days of use, my "Most Used" list hadn't changed. It still had the Snipping Tool at the top, which I hadn't used once, and didn't include the Maps app, which I used quite frequently. Another difference: The width of the Start menu has increased, so more apps are visible. It takes up a much larger portion of my screen. On the upper right of the Start menu is now a Power button for shutting down or restarting Windows. And there's also a button for expanding the Start menu. Click it, and the Start menu takes up the entire screen. This is, in fact, the interface that touch devices eight inches or larger will use by default instead of old Windows 8 Start screen. The same button will shrink the Start menu back to its previous size. 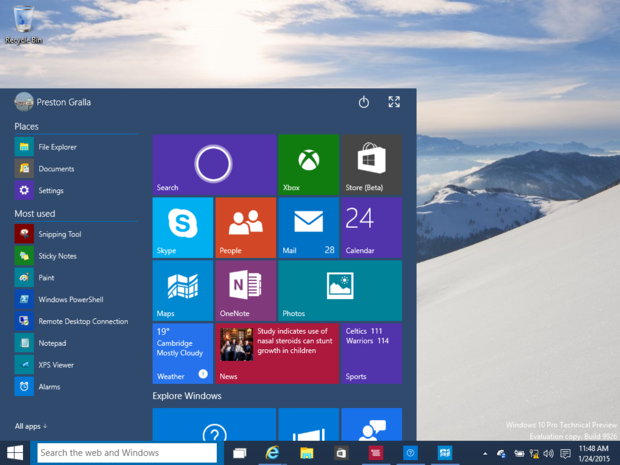 The Windows 10 Start menu can expand to show a wide array of app tiles. This will automatically appear on devices smaller than eight inches. There's another new feature as well: Continuum, which performs a kind of shape-shifting that allows Windows to automatically sense what type of machine it's running on, and alter its interface to reflect that. Let's say you use a 2-in-1 device such as the Surface Pro 3 that can work both as a keyboardless tablet and a laptop. 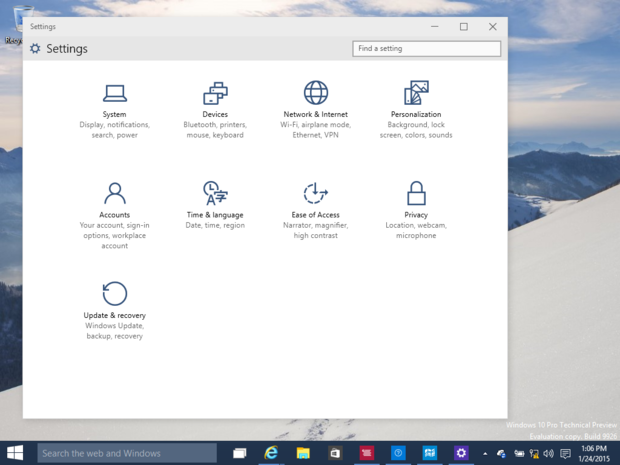 With Windows 10, when you use the device as a laptop, the interface has the smaller Start menu. Detach the keyboard, and a notification appears asking if you want to change the Start menu to full-screen mode, so that it has a tablet-oriented interface. 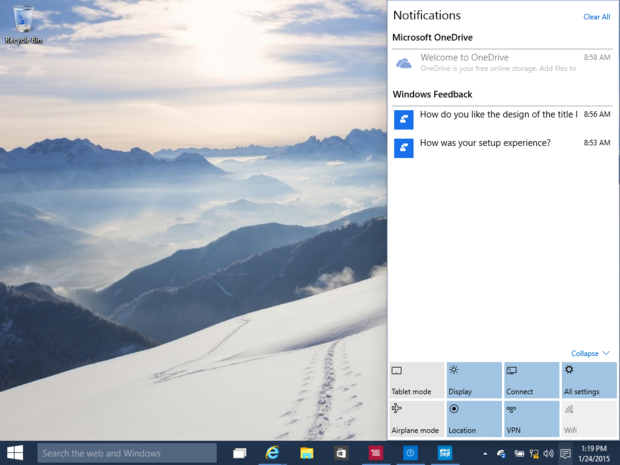 Re-attach the keyboard, and a notification asks if you want to use the smaller Start menu. All in all, I found this new arrangement went a long way towards unifying the OS into a single interface. Windows no longer feels like a Rube Goldberg contraption -- a tablet-oriented operating system for which traditional computers are an afterthought. One of the more maddening aspects of Windows 8 was the way in which settings were spread throughout the operating system: Some were found in Windows 8-style Modern apps and others in the Control Panel on the desktop. It was difficult to remember which settings were found where, and annoying to have to constantly switch between Windows 8's dueling interfaces. This preview of Windows 10 now has a single place you're supposed to go for all those settings: the Modern-style Settings app. It's logically organized and simple to navigate, so you can easily drill down into system settings, device settings, network settings and more. The new Settings app is logically organized and makes it much simpler to tweak features than it was in Windows 8. However, those who really like deep dives into their settings (like me) won't find the new Settings app up to the task, and will still need the Control Panel -- which hasn't been killed. For example, if you want Windows to display files that are normally hidden in Windows, or display file extensions for common files, you're still going to have to go to the Control Panel and dig into File Explorer options. Still, the new Settings app is a big improvement over the Windows 8 version. For most things, you'll be perfectly content using it. It may be that there will always be a place for the Control Panel, because to fit all of Windows' obscure settings into a single Settings app could possibly make that app too complex and difficult to use for most tasks. There have been a number of other interface changes as well, including the banishment of the Windows 8 Charms Bar, which appeared on the right-hand side when you swiped from the right or pressed the Windows key + C.
I was never a fan of the Charms Bar. I had always found it to be an awkward mish-mash of unrelated icons, including those for searching, changing settings, sharing content, going to the Start screen and managing devices. Thankfully, it has breathed its last -- although I'm no big fan of its replacement, either. The Action Center displays notifications on the right side of the screen from Windows itself as well as from Mail, News and other apps (say, from a Twitter client) if you ask it to. It's a good idea, but even though I configured my apps to display notifications, none of them showed up. I've seen online reports from people who said Action Center notifications worked for them, so it may be something about my setup that caused the problem. In place of the Charms Bar is the Action Center, which displays notifications and offers quick access to changing some settings. The Action Center includes at its bottom a group of icons that lets you make changes to some settings, such as switching to tablet mode, turning on Airplane mode, configuring Wi-Fi and using a VPN. That's an odd collection of settings, because they're certainly not the ones most people use frequently. How often to you need to use the Windows VPN, for example? Or switch to Airplane mode? Microsoft needs to refine which settings would be most useful to display here. The last big change in this rev is the addition of Cortana, Microsoft's Siri-like digital assistant, which first appeared in Windows Phone. There's now a Cortana search bar underneath the Windows 10 Start menu. To use it, you type in a search term, question or request. If you prefer speech to typing, you can tap the microphone key and say "Hey, Cortana," or "Hi, Cortana" and speak your term, question or request. At that point, Cortana does a universal search, looking through files, settings, email, videos, music and apps on your PC, in your OneDrive account (Microsoft's cloud-based storage service) and the Web. The way the search results are displayed varies according to what you're looking for. The Cortana digital assistant is now available across the entire Windows continuum. So if you are looking for information on the Web, such as "How much snow did Boston get this year?" Cortana will launch Internet Explorer and perform a Bing search. 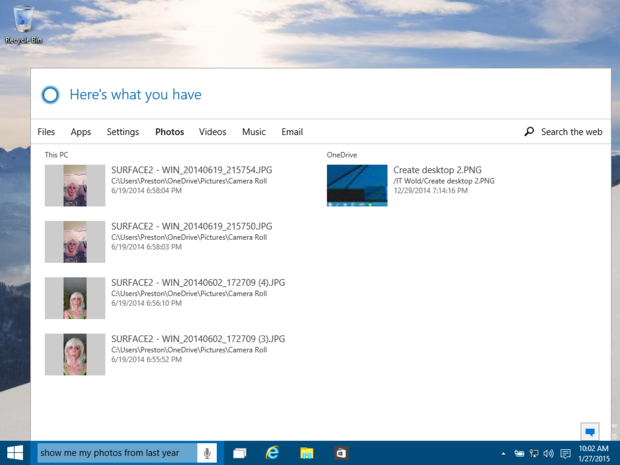 If, however, you say "Show me my photos from last year," a different screen appears, which displays the categories such as Files, Apps, Settings, Photos, Videos, Music and Email (but will only show any actual files from your system or OneDrive that fit your search criteria). You can click any category to see results and click any result to launch the associated app. At first, I found that having two types of interfaces for search results was somewhat disconcerting, but after a while I got used to it. It makes sense to display results for files differently than results for information. You can use Cortana to search for files on your PC. You can also get the latest news and information by tapping the Cortana button on the left side of the search box. Up pops a vertical, scrollable screen. Click any item to get more information about it. Cortana is tied to your Microsoft ID in the same way that Google Now is tied to your Google email address. So when you log into Windows on any device, Cortana already knows your preferences. I'd already used Cortana on a Windows Phone, and so Cortana knew all about me when I used it on Windows 10. When I tapped the Cortana button, it knew I live in Cambridge and showed me the upcoming weather (not so good; at the time, the winter's first blizzard was bearing down on the city). It knew I was a Patriot's fan (not so good again; plenty of articles about Deflategate). It knew the time of day and where I lived, so popped up a list of nearby restaurants where I might want to have lunch. Before installation, I was not convinced Cortana would be particularly useful on a desktop or laptop. In my previous tests on Windows Phone, I found its ties to location-based services of most help: Telling me about nearby stores and restaurants, offering advice about driving and traffic and so on. I wasn't sure that I would have much use for information like that on a PC that wasn't used on the go. But I found its searches on my PC for documents quite useful, as well as its listing of relevant news. 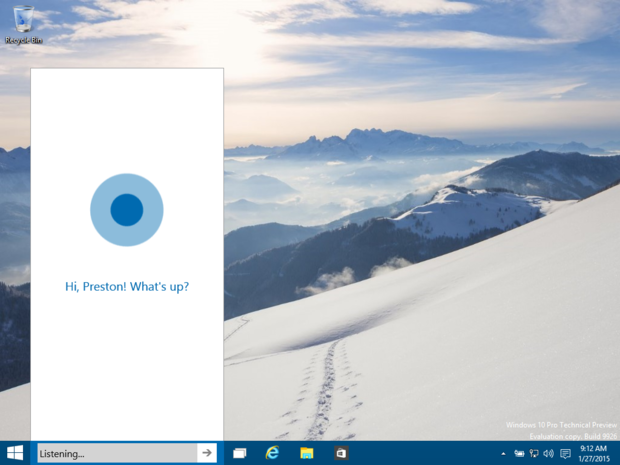 Cortana is a prime example of Microsoft's attempt to unify Windows not just as a single operating system for traditional PCs and tablets, but for phones as well. Use Cortana on all your devices, and it learns more about you and becomes more useful. The apps that shipped with Windows 8 were underwhelming, often low-powered and not particularly useful. 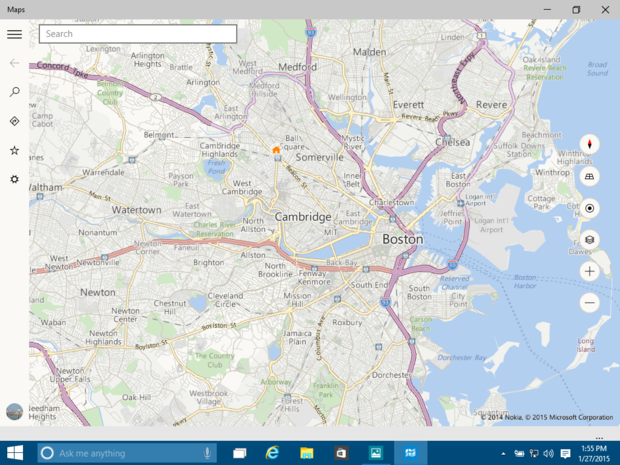 In this Windows 10 update, Microsoft turns its attention to one in particular -- Maps -- and does a fine job with it. Maps features a new layout, with the map on the right and a sidebar on the left with icons for searching, adding a location to a Favorites list, getting directions and changing your settings. Overlaid on the right side of the map are buttons for zooming, tilting the map, changing the map orientation, adding overlays such as traffic or changing to an aerial view. A My Location button centers your current location on the map. You can also control the app via Cortana by speaking directions rather than typing or tapping them. The Windows Maps app has been revamped, although it still doesn't measure up to Google's Maps app. The most useful new Maps feature is the ability to download maps so that you can use them when you're offline. This can be welcome if you're using a tablet or laptop beyond the reach of an Internet connection, or if you're traveling overseas and want to save on data use. Is there anything about the Maps app that might persuade a dedicated Google Maps user to switch? Likely not. There's no Street View, for example, which for me is a deal-breaker. As for other built-in Modern apps, Microsoft made some changes to Photos, which is still a work in progress. It now automatically enhances your photos by eliminating red eye and changing brightness and contrast levels. But many promised features are still missing, including the ability to automatically group related photos into albums. Also missing are basic features such as the ability to tag photos. There are also minor changes throughout the operating system that are less important. File Explorer, for example, has more colorful, brighter icons, as well as the ability to pin a folder so that it's always within reach. You can now schedule a specific time for Windows to reboot and install updates. There's also a beta version of the new Windows Store (the old one is here as well) with a simpler, cleaner interface.